dispel4py: An Open Source Python Framework for Encoding, Mapping and Reusing Seismic Continuous Data Streams: Intensive Analysis (talk). VERCE: A productive e-Infrastructure and e-Science environment for data-intensive seismology research (poster). International Conference on Information and Communication Technologies for Disaster Management, 30 Nov-2 Dec, Rennes, France. EGI Community Forum 2015, 9-13 Nov, Bari, Italy. 11th IEEE eScience 2015, 31 Aug-3 Sept, Munich, Germany. ISC, 12-14 July, Frankfurt, Germany. International Workshop on Theory and Practice of Provenance, 8-9 July, Edinburgh, Scotland. VERCE Training , 1-3 July, Liverpool, U.K.
OSDC PIRE Training and outreach, 1-8 June, Amsterdam, The Netherlands. TIDES Training school on Seismic Data, 1-5 June, Bertinoro, Italy. ICCS, 1-3 June, Reykjavík, Iceland. EGI conference, 18-22 May, Lisboa, Portugal. EGU, 12-17 April, Vienna, Austria. VERCE Training , 9-11 March, Munich, Germany. 5th Munich Earth Science School, 22-27 Feb, Sudelfeld, Germany. e-Infrastructures for Earth Sciences workshop (EGI, GÉANT, PRACE and EUDAT), 22-23 Jan, Amsterdam, The Netherland. AGU Fall Meeting, 15-19 Dec, San Francisco, USA. Workshop on Data-Intensive Scalable Computing Systems, (DISCS-2014), 16 Nov, New Orleans, USA. IEEE ICIP 2014 (International Conference on Image Processing), 27-30 Oct, CNIT La Défense, Paris, France. 13th International Semantic Web Conference, (IWSC 2014), 19-23 Oct, Trentino, Italy. VERCE Data Intensive analysis webinars, 15-16 Oct.
EGI-GEANT Symposium on Federated Community Cloud Services for e-Science & EGI Conference on Challenges and Solutions for Big Data Processing on Cloud, 24-26 Sep, Amsterdam, The Netherland. 2nd European Conference on Earthquake Engineering and Seismology, 24-29 Aug, Istanbul, Turkey. VERCE Forward Modeling training webinars, 10 and 17 July. NUMGE 2014 8th European Conference on Numerical Methods in Geotechnical Engineering, 18-20 June, Delft, The Netherlands. EGI Community Forum 2014, 19-23 May, Helsinki, Finland. SCI-BUS Meeting, 5-9 May, Cesme, Turkey. EGU General Assembly 2014, 27 April-02 May, Vienna, Austria. 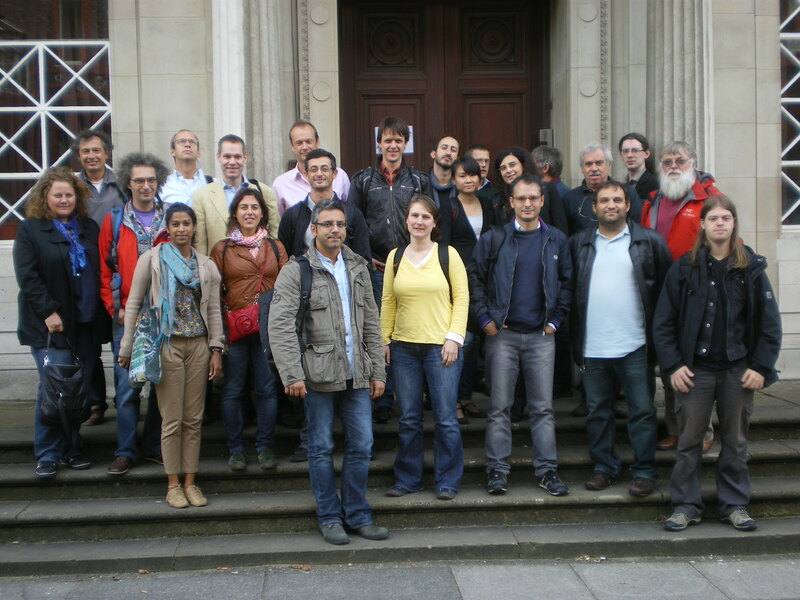 Solid Earth Observing Systems, 14-15 April, ULIV, UK. ICRI Conference, 2-4 April, Athens, Greece. GEO 2014, 11th Middle East Geosciences Conference and Exhibition, 11-12 March, Bahrain International Exhibition and Convention Centre, Bahrain. SCI-BUS, SHIWA, EDGI joint Summer School on Workflows and Gateways for Grids and Clouds, Budapest, Hungary, July 2-6. Introducing the latest developments in Grid and Cloud computing. 2012 PRACE Scientific Conference, June 17, Hamburg (Germany). Top European scientists highlighted advances in large scale simulation and key results obtained with support by PRACE, the Partnership for Advanced Computing in Europe. The European Commission and the PRACE director presented Europe's vision for HPC. 1st EPOS-ORFEUS, Erice, 25-30 May. This workshop focused on the analysis of seismological data and their use for both monitoring and research. EGU General Assembly 2012, Vienna, Austria, 22-27 April. First EGI Community Forum, March 26-30. Event hosted by EGI.eu in partnership with the Munich Network Management, a consortium of four German research institutions. at LRZ in Garching near Munich, Germany.